The popular MBC drama The Moon Embracing the Sun that is making a hit in viewership ratings is actively pushing for extension of 4 episodes, for a total of 24 episodes. The “4-episode extension” of The Moon that Embraces the Sun has noting to do with except its high popularity. It achieved 18.0% rating on its premiere episode on January 4th, 2012. It’s rare for the first episode to rate close to 20%, creating a storm. Its 8th episode gained the rating of 31.7%, successfully supersedes the storm with tornado. The ratings of the drama exceed 30% even though it’s not yet passed the half-way mark, but whether it can achieve even higher ratings in future is uncertain. However, based on the explosive strength of the drama, it’s expected to break the 40% ratings soon. Jumong and Queen Seondeok used to exceed 50% ratings. The Moon that Embraces the Sun is endowed with the title of “resurrection of MBC sageuk.” The Moon Embracing the Sun is originally planned for 20 episodes and scheduled to end on March 8th, 2012. If the extension of 4 episodes is confirmed, then the drama will end on March 22nd, 2012. To avoid been cannibalized by and overlapped with The Moon that Embraces the Sun, KBS TV series Wild Romance that is ending on February 23rd, 2012 has urgently worked out a 4-episode TV series special to air before the end of The Moon that Embraces the Sun, setting up a safety for the succeeding drama, Man of the Equator. 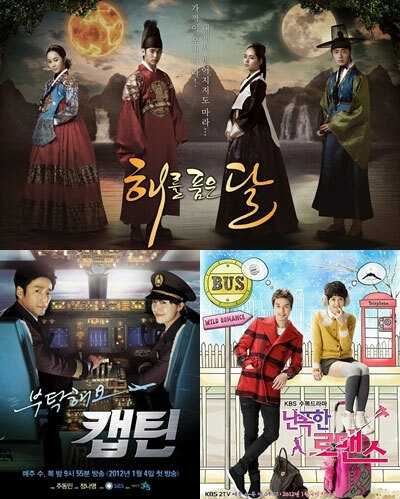 Meanwhile, SBS is extending Please Take Care of Us, Captain by 4 episodes, delaying the debut of Rooftop Prince.